Jennie Loriston-Clarke is one of Britain's leading riders and trainers. She has represented Great Britain in four Olympic Games, Munich, Montreal, Los Angles, and Seoul. She also rode in the alternate Olympics in 1980 where she was 6th with Dutch Courage. She won a Bronze Medal at the World Championships at Goodwood in 1978. Jennie is a former FEI International Dressage and a FEI Internation 3-Day Event Judge. She was the first Briton to be invited to judge the World Breeding Championships at Verden and has judged many World Cup Dressage Qualifiers. She was part of the Ground Jury at the World Cup Finals in Amsterdam in 2005. She is a Fellow of the British Horse Society. In 2006 she was the first recipient of the Queen's Award for Services to Equestrianism. 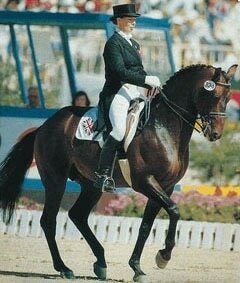 In 2007 she was elected Chairperson of British Dressage. In 2013 Jennie was asked to be President of British Dressage and was also nominated to be Chairperson of Sport Horse Breeding of Great Britain.